Major disruptions are expected in the CBD on Friday evening, as details of a major incident in Bourke Street emerge. She heard someone start screaming "he's got a knife". 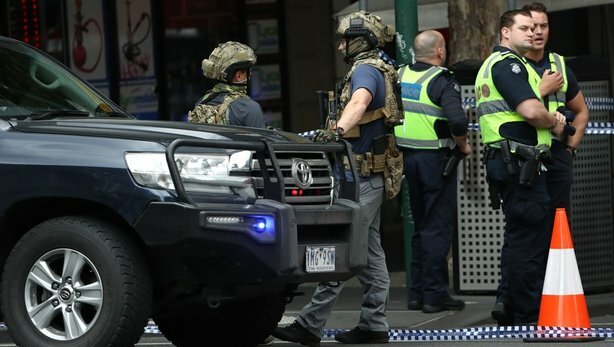 The incident occurred between Swanson and Russell Streets along the pedestrian strip of Bourke Street mall around 4:20 p.m. local time, according eyewitnesses, in what has been described as a distressing scene. One of the officers shot him in the chest, Ashton said. Mr Ashton said the Counter-Terrorism unit is investigating and he can not give any details about the attacker's identity. Victorian Premier Daniel Andrews said it was "distressing" day for Melbourne. A Somalian man went on a knife rampage in central Melbourne today, stabbing three people after setting a auto full of explosives on fire. "Because he was on his stomach, they turned him over to see if he's all right, he was still alive", Markel Villasin, told Australian Associated Press. Supt Clayton told reporters that when officers got out of the auto, they were confronted by a male brandishing a knife and threatening them. Supt Clayton confirmed that when officers arrived, they were quickly cornered by the armed man as the situation escalated. Ashton said were not looking for any other attackers, but declined to categorise the incident as a "lone wolf attack".